There are so many great properties to choose from but one of our favorites is Perdido Beach Resort. This resort is right on the beach with premiere amenities such as indoor/outdoor pool, fine dining, fitness center, beach volleyball, and live entertainment poolside! Not to mention its right across the street from Sail Wild Hearts! If you’re looking to keep it casual, The Gulf is a great choice. Enjoy a cocktail, seasonal menu items, relax under some palm trees, and watch the sunset right over the water! If you’re looking for something more upscale, we recommend Fishers at Orange Beach Marina. Fisher’s Upstairs is what fine dining dreams are made of. Sit along linen drapes, incredible light fixtures and comfortable tables to enjoy a truly remarkable meal. 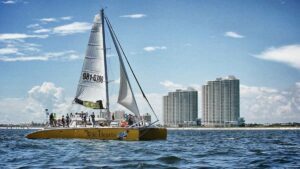 You can’t plan an Orange Beach girls weekend without including one (or two) of our sailing adventures! Explore the gulf with our Snorkel and Sail Tour – a two-hour excursion with a guided snorkel session at Alabama Point! Or just take in the views with our Sunset Cruise. This cruise is around two hours with complimentary bottled water, soft drinks and appetizers. Feel free to pack a cooler of your preferred adult beverage to enjoy on the cruise! This is your weekend! Relax on the beach, read a book, drink champagne, eat a good meal and treat yourself to everything OBA has to offer!